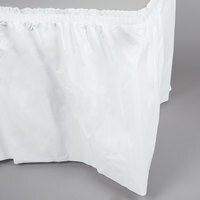 Add class and elegance to your event with the help of this Creative Converting 010047C white plastic table skirt. Whether you're using it for a wedding reception, birthday party, catering event, or other special venue, this white plastic table skirting will help to make your table settings aesthetically appealing. Made from plastic, this skirt will repel water and other liquids, keeping tables from being damaged. Featuring an adhesive strip, our plastic table skirts easily apply to tables so you can dress them up in a matter of minutes. Add some style to your special occasion with this white table skirt! I love these table skirts - they are easy to put on and give a nice finished look to any table when having a buffet. I went with black skirts and white tablecloths (my tuxedo look) over my own tables - not buffet tables. It allows me to store extra supplies underneath and protect my nice woodwork. Then it all comes off in one nice piece! Always good for every party and events. Good for six foot banquet table. Perfect size to hide misc things under the table and it is very professional. A very nice style white plastic table skirt that is great for making the tables look wonderful. The table skirts are great for outdoor events and help secure the top cloth to the table. Perfect for adding a touch of class to our main dining hall. Came in handy for weddings and large dinners for guests. A perfect fit, quick delivery and exactly what I had wanted. Good weight for plastic table skirt; coupled with white table roll will give any table a nice, clean, classic look. I would definitely purchase again. These were my most used skirts at my event.I love how long ,durable and classy they were.As you will see in my pictures.They brought my white party together even better! Good product and the price was better than party city. We taped ours to disposable tablecloth for extra security. they put the finishing touch to our buffet table. Basic white disposable table cover, which is indeed what I thought it would be. Its goid fir one time use at an event or party, then simply toss it. GREAT GREAT GREAT. Our banquet looked amazing. These are sturdy, self stick and STAYED ON! Made our tables look neat, clean and spectacular! they are not cheaply thin, easy to use, just peel off and stick! Our tables were great!!!!! This white table skirt was just what we needed for our event. The quality was good and the price was equally good. The quality is equal to the table skirts I previously purchased at the party stores. We used this for our buffet serving table and it was a nice compliment to the white tablecloth that we also purchased from Webstaurantstore. Will definitely order more. used these to dress up serving table at a wedding. works great, looks nice . sticks to table great. great value. we will buy more for future events. I absolutely love this product! This creative converting white plastic table skirt is beautiful! For plastic it looks great! It's easy to clean with no rips in the process! This is my go to 'all around' staple. I'm assured white will match any party theme. It can be used in formal or casual settings. The look is great. I am glad that I decided to purchase this item. What I like most about it is that it provides an adhesive strip, making it easy to apply and holds very well. Nice job, guys! I have not used these, but I noticed that they are surprisingly great quality. I ordered them in white and trust me it's very white. I loved that because a lot of white items always seem to come in a little on the tinted white side which i don't appreciated. This is good. I love thos crisp white table skirt. It is going to look amazing at my friends sons baptism for the maintable. Very excited to put this to good use. These table skirts are just what I needed. I used them underneath of a tulle skirt that I made for my daughter's party. They worked perfectly in covering the table legs as well as making the tulle seem thicker. I needed to get some table skirts for my wedding and since I opted not to rent linens, these are perfect. They look a bit wrinkled in the stock photos but when I opened them up they were actually pretty much wrinkle free. The price can't be beat and they arrived in a flash. Thanks Webstaurant Store! This is a great table skirt. Very durable, easy to install and even great for re-use!! Give the decor of any special event a great fancy look!! Also very reasonable (even cheaper) in price than other prices i've seen in stores. We use this table skirt all the time. Looks very good. I plan to order more. I would recommend this product to everyone. Good investment. I would strongly recommend having several sets of these skirts on hand. They go a VERY long way in improving not only your brand image but your catering customer's experience, maintaining repeat business. Excellent product! These Hoffmaster table skirts will make any catering event look so nice and for the price you have to have them. I keep alot on hand. These are great to have for display tables! I use them all the time for tables where I display an ice carving for an event!! Classy but affordable!! These table skirts are great for at home parties and catering! Hide unwanted tools underneath the table with these classy, disposable, table skirts! Great Buy! I always use these table skirts when catering a party, and they come in different colors.they really look good on my folding tables i bought from this site. Used these for a 75th birthday party. They really dressed up the tables - plus they hide all the boxes and extra things you have to bring! Would recommend. I will recommend this product to anyone! When I set-up my display tables and serving stations these table skirts help provide a clean canvas to display my works of art. These skirts are everything disposable should be: inexpensive, consistently manufactured, easy to use and good looking. I use them every weekend doing cooking demos at a local farm market. They are an easy way to dress up my presentation table. The sticky tape on the back applies easily and stays on even in a breeze. I like using these rather than cloth on the food tables. If things spill, you can wipe it off and not have a huge wet stain. When the lights are dimmed, you cannot see the fold wrinkles as badly and they look quite nice. These are great to use with ice tables. 2 fit prefectly around them and since they are plastic, when the ice melts, they don't soak up the water! Quality is what I expected for plastic table skirts. Nothing too fancy but met the need for a tasting event where there would be a fair amount of liquid spilled. These are the best plastic tables skirts on the market. I use hundreds of these for both hot & cold sampling of foods and beverages. The range of colors allows me to match every occasion or sponsor. I've used these in the past when setting up buffet tables for miscellaneous events for the college students. They hold up well for the one time use, and look nice. The Hoffmaster Plastic Table Skirt is perfect when I need to set up a booth at an expo. After I cover my table with my tablecloth, the skirt attaches easily with the adhesive backing, and I have a professional looking table in no time. The skirting is extremely budget friendly as well, and when my event is over, I simply peel the skirt off and throw it away. Can't get any simpler than that. The table skirts are a very good quality. The color was a rich royal blue. The size and ease to put them on was great and the adhesive stayed put for the four days they were needed! Great product. Will keep on using them. Alice Dekow The Blackstone Pub & Restaurant.